I booked my tickets for the new exhibition at the V&A Museum "Shoes:Pleasure and Pain" and it got me wondering why all women love shoes. And the answer is simple: Because i doesn't matter if we are size 6 or size 16 we can all wear them. And there so many of them! Different styles, different colours, different designs... we just can't get enough! So I thought I should take a look at the Apple Store to check for applications for shoes. Why not play or shop with our favorite fashion item while we're on the move? This app is worth having in your phone if you are a serious shoe lover. 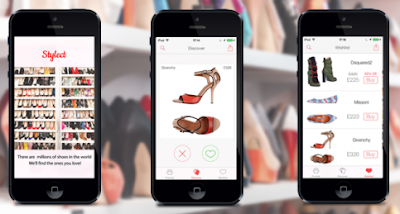 No wonder they call it the "Tinder for shoes". You can browse through thousands of shoes, you can express your love or hate for them by pressing "like" or "dislike" and you get to have the opportunity to buy your favorite one. There is also a sort of a magazine in there where you can see celebrities wearing designer shoes and how they match them with their outfit. This is supposed to be fun app where you get to design your shoes by choosing the style, the colour and even the accessories you want to put on them. But unfortunately is more for my 3 years old to play with rather than a grown up to have fun with. In this app you supposingly get to choose your facvorite pair of shoes and make your own shoe profile. But the shoes are not so nice and app is full of ads that don't allow you to have fun.